A perfectly located villa offering a holiday with genuinely no car needed! We have lived in Coral Bay for 10 years now. We live about 5 minutes away from the villa know what a suburb location it is. We are on hand for any queries and personally provide a welcome meeting at to the villa and can answer any queries you may have, We are both from a hospitality background and are qualified chefs so have an extensive menu for you in the villa, nothing is too much trouble from sorting, flowers, birthday cakes, drinks, anything to make your stay with us a little more special. The location near to the beaches and Restaurants is a huge asset. No need for a car while you on holiday. 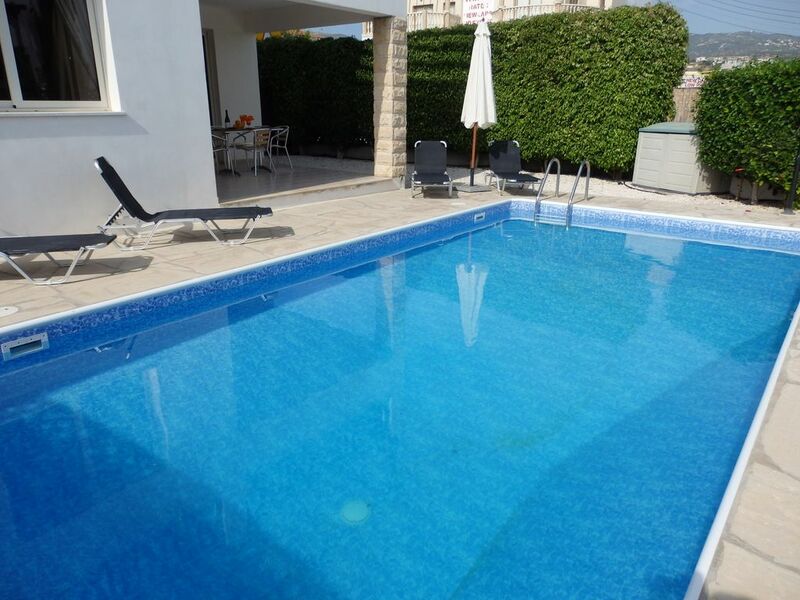 The villa offers all you could need for the perfect sunshine beach holiday whilst being able to walk to all the local bars and restaurants There is also a great bus service from Coral Bay to Paphos which runs every 15 minutes. A/C unit in the bedrooms and Lounge, ac also heats. Beds will all be made up for your arrival. For stays of 14 days mid let change of linen and towels. Yes. Off road parking and gazebo covered car port. Window to rear of the property, well equipped with breakfast bar leading to the open plan dining area. Lovely enclosed garden so perfect with children with olive trees, by the pool, weeping fig hedge to offer total privacy, to the rear off road parking on the drive and gazebo to offer shade. available to hire from Coral Beach, excellent scuba diving from Coral Bay Divers. Villa Potima View is located in the Heart of Coral Bay. A short walk takes you into the main strip of Coral Bay where there are plenty of Bars, Restaurants & Shops. Wide variety of cuisine all within walking distance from Local Cypriot Meze at Phidias Tavern to Italian, Mexican, Chinese, Indian & even Japanese Teppanyaki. There is a beach within 2 minutes walk next to the Aqua Sol hotel. The Main Coral Beach is a 10 minute walk away. Plenty of water sports available here from Jet Ski Hire to Para-sending and Banana Boat Thrill rides. There is a great bus service from Coral Bay to Paphos every 15 minutes which runs until midnight.